Concerto for Piano #1 "Romantisches Klavier-Konzert"
Concerto for Piano #2 "Castelli Romani"
Thanks to AS&V, the Marx revival is now well on its way and this fourth instalment includes the rarely performed Romantic Piano Concerto of 1919/20 and the world première recording of "Castelli Romani" of 1929/30 considered the composer's second Piano Concerto. This Austrian musician, born in 1882, was from his childhood days, inclined towards a musical career. His mother spotted his great talent very early on and enrolled him in a renowned music school in Graz. Marx kept studying in secret due to his father's opposition and he soon acquired fame as an excellent pianist. From 1905, the composer started to make a name for himself as a writer of fine piano songs and between that year and 1912 he composed around 150 such pieces. During his four decades as professor of theory and composition in Vienna and Graz, he became one of the most admired and active teachers, winning international fame not only for his ability to impart his knowledge with simplicity, but also for his many orchestral compositions, including the two concertos on this disc. The "Romantic" is a huge work, written mainly in the late-Romantic style, although the piano part definitely belongs to the 20th century. Great demands of virtuosity and stamina make this inspiring concerto very difficult to bring off, but David Lively gives an emotionally charged performance, full of dexterity and passionate involvement, that one hardly notices that the work lasts for more than 40 minutes. The "Castelli Romani" is named after the legendary ruins on the forested Roman hills. 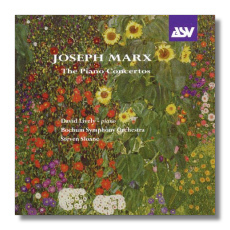 Marx's grandmother was Italian and his lasting fascination with the Italian grand scenery might have been the main inspirations for this colourful and perfumed work. Full of magic, mystery and that unique allure of the Mediterranean, this piece is as captivatingly fresh as anything written by Ravel and Respighi. Its suggestive charm leaves the listener entranced in a world of idyllic beauty. Lively captures all these nuances with ease and panache giving an interpretation that is sensitively balanced and painstakingly detailed. The relatively unknown Bochum Symphony Orchestra under Steven Sloane reveal themselves as an excellent ensemble giving the soloist wonderful support. I'm looking forward to Volume 5.